Since its launch in the early 1940s, only a very small numbers of reference 3835 have been produced. 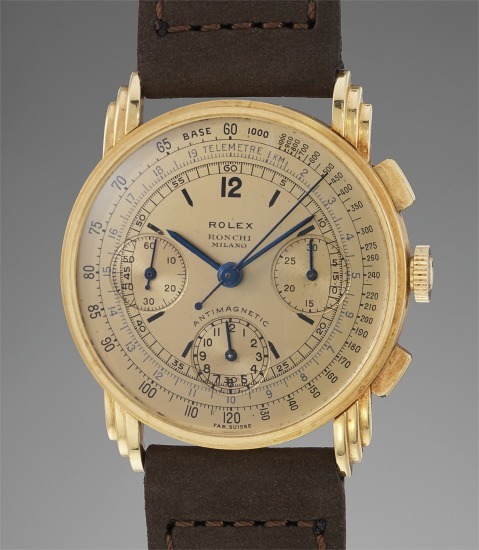 Mainly cased in pink gold, the watch was also available in yellow gold with champagne dial like the present example. Reminiscent of the design of the Chrysler building the triple stepped lugs exult a strong Art Deco inspiration and give the watch a sculptural and arresting style. This bold geometric design made the watch extremely sensitive to polish and luckily, the present example had never suffered from this as the case and specially the lugs are crisp and untouched. In fact, one can say that this watch has been cherished but not worn very often. The beautiful champagne dial is in excellent condition and proudly features the retailer’s name, Ronchi Milano, just beneath the Rolex signature. In business since 1939, the shop, based in Milan, is still an Official Rolex Retailer to this day. Preserved in excellent and original condition, this watch is a beautiful example of a stylish non-oyster antimagnetic chronograph. The watch stands out by its charismatic untouched champagne dial, beautifully complemented by the retailer’s signature. It is probably one of the most desirable examples a collector could dream of.